Information on proper care of your night guard including cleaning methods, storage and suggested cleaning products to use. A dental night guard can become gross pretty quick. The good news is, you don’t have to deal with the funky smells and color changes if you take the time to learn about and care for your device. Proper care and maintenance will ensure a longer lifetime for your dental guard. Letting saliva and water sit in your guard can turn it from a nice clear to yellow and scary-looking FAST. Why does my dental night guard turn yellow and how can I prevent this? We know many of you don’t particularly enjoy reading long articles. 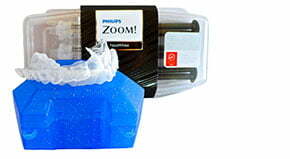 KEEP YOUR DENTAL NIGHT GUARD CLEAN AND DRY BETWEEN USES. CLEAN AND DRY IS KEY. A night guard is a plastic device designed specifically for your dental anatomy. It is meant to be worn over your teeth while sleeping. 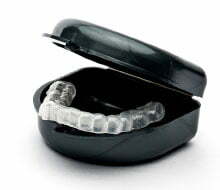 Night guards help to reduce damage and discomfort caused by nighttime bruxism (bruxism is grinding of the teeth). Because the mouth is moist and warm, it is an ideal home and breeding ground for bacteria and other unwelcome guests. Some bodily bacteria is normal and healthy, but dental devices such as night guards should remain sterile, clean, and dry between uses to avoid problems like bad breath (halitosis), discoloration of the guard, and stow-away debris such as food particles and plaque. This article includes various methods for cleaning your custom dental night guard. While basic hygiene principles are universal for all night guards, it is important to speak to your dentist or other manufacturer about specific care and maintenance instructions, since night guard materials may vary. All dental night guards should be cleaned between uses and before being stored. After cleaning, it is important to completely dry your night guard prior to storage. Your night guard case or holder should also be cleaned and dried regularly, since dust, bacteria, and other nasties like to congregate in dark, damp environments. Even with proper care, dental night guards wear out over time, so it is important to check yours for signs of aging. You may notice that your night guard doesn’t fit as well after some time (typically months or years) and you may even be able to see or feel imperfections in the surface or structure of the guard. When in doubt, check with your dentist, night guard lab, or other dental health provider. Don’t let your dental night guard turn yellow! 1. Brush the guard thoroughly with baking soda or toothpaste. Note: some toothpastes can be too harsh and abrasive to use on your night guard. *Update* We have experienced positive results (personally and through customer feedback) from using a more natural organic cleanser such as Dr. Bronner’s Peppermint Soap. Dr. Bronners is a multi purpose cleansing product made with organic oils, and no detergents. It leaves your guard smelling fresh and feels magnificently clean. This will not remove existing stains but when used as part of your cleaning regimen, can help preserve the longevity and prevent further staining. 2. Dry it with a soft cloth. 3. Rinse out the case or holder. 1. After brushing the guard, soak it for ten (10) minutes in a glass of antiseptic mouthwash. 3. Brush the case with baking soda or toothpaste and then soak it for ten minutes in a glass of antiseptic mouthwash. 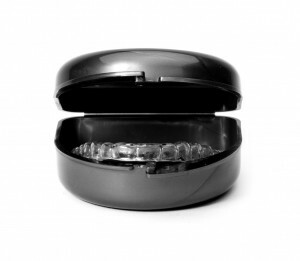 There are as many ways to clean your night guard as there are to clean your teeth. Some people prefer baking soda, while others opt for toothpaste. Still others prefer to soak their night guards in antiseptic mouthwash. Below, you’ll find a link to a product recently approved by the American Dental Association specifically for cleaning mouthguards. The ADA determined that this product in particular is a great option for cleaning your night guard without causing any incidental damage to the device. Of course, another common approach is to combine several of these techniques in a unique routine best-suited to the individual. Whatever approach you take, it is highly recommended that you speak with your night guard lab or an oral health professional to make sure that you don’t use a cleaning method that would be too abrasive or otherwise inappropriate for your specific night guard. Many wearers of night guards have experienced this. Black spots or little spore-like green-grey spots start to appear on the appliance. This can occur as a result of leaving sitting water in the teeth compartments and closing it up in the night guard retainer case. Remember, mold is a microscopic, living organism. It is not a bacteria or a virus. There are several recommendations on how to remove spots. One dentist even says he has no problems with his patients using diluted household bleach or acid (vinegar). Also denture cleaner pills. 10 water to 1 bleach for about 30 mins, then brush and rinse. You may be able to have your dentist or online dental lab use tools to buff out the spotty areas or it may be time to purchase a new night guard. Hopefully, this article has helped you understand some of the options available for cleaning your dental night guard. This information, together with input from your lab or dental health specialist, will help to ensure that your night guard stays safe and effective for as long as possible. 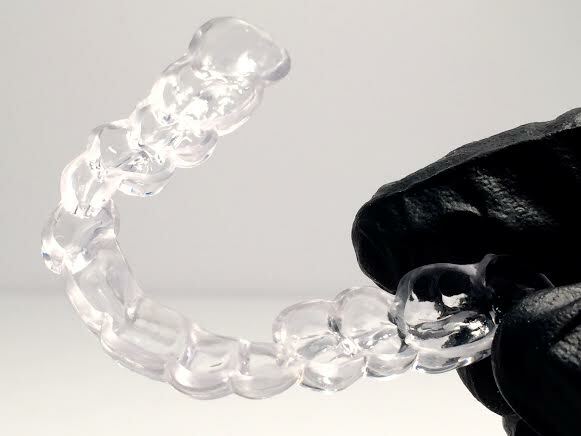 Looking to replace your existing dental night guard? 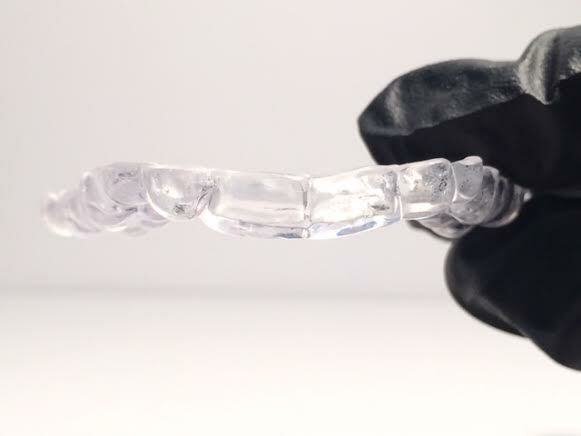 Sentinel Mouthguards offers three different types of custom made dental night guards; hard soft and dual laminated. In addition to our 100% satisfaction guarantee and replacement warranty, we offer free all inclusive shipping in the USA. Happy shopping!